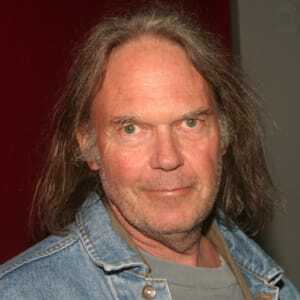 Born in Canada in 1945, Neil Young arrived in the U.S. in the mid-1960s and co-founded the band Buffalo Springfield. He earned fame both as a member of Crosby, Stills, Nash & Young (CSN&Y) and as a solo artist, writing and recording such timeless songs as "Old Man," "Hey Hey, My My (Into the Black)," "Rockin' in the Free World" and "Heart of Gold"—a No. 1 hit. Nicknamed the “Godfather of Grunge” for his undeniable influence on that genre, Young is also a strong advocate for environmental and disability issues, as demonstrated by his co-founding of the Benefit for Farm Aid and the Bridge School Benefit Concerts. More than 50 years into his musical career, he continues to record and tour on a regular basis. Neil Young was born on November 12, 1945, in Toronto, Canada. Four years later, his parents, Scott and Edna, who went by the name Rassy, moved to the small rural town of Omemee, where Neil and his older brother, Robert, spent their early youth. Despite the idyllic setting, however, Neil’s boyhood was a complicated one. Suffering from epilepsy, Type 1 diabetes and polio, by 1951 his health had deteriorated so far that he was unable to walk. With time, Neil was able to overcome his ailments, and with his mother’s encouragement he began to nurture an interest in music, learning to play both the ukulele and banjo. However, his parents’ marriage, which had been strained for some time, did not recover, and in 1960 they finally divorced. Following the split, Robert stayed with his father in Toronto and Rassy relocated to Winnipeg with the teenage Neil, who by this time was far more interested in his musical pursuits than he was in academics. Over the next few years, he would play with several bands before forming the folk-rock group the Squires in 1963. Intent on a career as a musician, he dropped out of high school and started performing at clubs and coffeehouses in the area, first with the Squires and later as a solo act. While making his rounds on the Canadian folk circuit, Young began to rub elbows with other up-and-coming Canadian musicians, including fellow folk singer Joni Mitchell and rock band the Guess Who. He also met Stephen Stills during this time and briefly joined a band called the Mynah Birds, which included future funk star Rick James on bass. The group managed to win a contract with the legendary Motown label in 1966, but disbanded before they could finish their album. Setting out in search of new frontiers, Young and his friend Bruce Palmer packed their possessions into Young’s black Pontiac hearse and made the long drive to Los Angeles, California. In Los Angeles, Young ran into Stephen Stills, and soon thereafter, Young, Stills, Palmer, Richie Furay and Dewey Martin came together to form the band Buffalo Springfield. They released their debut, self-titled album in December 1966, and it managed to crack the charts. The single “For What It’s Worth” even became a Top 10 hit. The band soon attracted a large following and was acclaimed for its experimental and skilled instrumental pieces, inventive songwriting and harmony-focused vocal composition. The music-listening public got its first introduction to Young’s talents on such tracks as “Broken Arrow” and “I Am a Child.” However, by 1968, strain in Buffalo Springfield led to Young striking out once more on his own. Young signed with Reprise Records in 1969 and released his self-titled debut to mixed reviews, though it hinted at the originality and willingness to experiment that would define his body of work. But Young followed up just a few months later with Everybody Knows This Is Nowhere, on which drummer Ralph Molina, bass player Billy Talbot and guitarist Dan Whitten, collectively known as Crazy Horse, backed him up. With their raw sound serving as the counterpoint to Young’s distinctively melancholy and untrained voice on such standout tracks as “Cinnamon Girl” and “Down by the River,” the album climbed up the charts to No. 34, and eventually went gold. Meanwhile, Young had reconnected with Stephen Stills, who had formed a new group with David Crosby of the Byrds and Graham Nash of the Hollies. Young joined the trio, which was renamed Crosby, Still, Nash & Young and they began to perform and record, playing the legendary Woodstock Festival in August 1969. The band’s subsequent tour and album release, 1970’s Déjà Vu, catapulted them to fame—so much so that they were at times referred to as the “American Beatles.” However, Young’s relationship with his bandmates quickly became contentious, and he left the group to focus more exclusively on his solo work. The move quickly paid off, with his 1970 album After the Gold Rush breaking into the Top 10 and featuring such Neil Young classics as “Only Love Can Break Your Heart,” “Tell Me Why” and “Southern Man.” (The latter, a condemnation of racism that angered many Southerners, would inspire Lynyrd Skynyrd’s “Sweet Home Alabama,” in which Neil Young is called out specifically.) Young outdid himself the next year with Harvest, a hallmark work that contains the songs “The Needle and the Damage Done,” “Old Man” (inspired by the aging caretaker of the ranch he had recently purchased in the Santa Cruz mountains) and “Heart of Gold,” which is Young’s only No. 1 hit to date. But just as he reached this early peak, Young was faced with one of the more difficult periods in his life. At the end of 1972, Young and his girlfriend, Academy Award–winning actress Carrie Snodgress, had a son, Zeke, who was born with cerebral palsy, and Snodgress had to set aside her acting career to care for him. A few months later, shortly after being fired by Young before their upcoming tour, Crazy Horse guitarist Dan Whitten died of an drug overdose. These events were compounded by a string of relatively unsuccessful projects, including the 1972 film Journey Through the Past, the live album Time Fades Away and 1974’s On the Beach. Young and Snodgress split up in 1975, the same year that Young released his album Tonight’s the Night, which had been recorded shortly after Whitten’s death and reflected Young’s frame of mind with its dark character and themes, as well as Zuma, a hard-edged album featuring Crazy Horse’s new lineup, with Frank Sampedro replacing Whitten on guitar. The second half of the decade would prove to be a more positive one for Young, who teamed up once more with Stephen Stills to record Long May You Run, which reached No. 26 on the charts and went gold. In 1977, he released the more country flavored Stars ’n Bars as well as the triple-LP compilation Decade, which featured a handpicked selection of his work up to that point. Things got even better the next year, when Comes a Time broke into the Top 10, he married Pegi Morton (who was waitress at a restaurant near his ranch and would inspire many of Young’s songs in the future, most notably, “Unknown Legend”) and embarked on a tour with Crazy Horse called “Rust Never Sleeps,” during which they showcased songs from an upcoming album. Released in 1979, Rust Never Sleeps echoed the structure of the concerts, alternating between quiet, acoustic tracks and aggressive electric numbers. Among its highlights is one of Neil Young’s best-known tracks, the anthem “Hey Hey, My My (Into the Black).” A double LP recording from the tour, Live Rust, was released later that year, reaching No. 15 on the charts. Young began the 1980s by indulging his experimental urges, not always to the best results. His first album of the new decade, Hawks & Doves, was more or less a collection of acoustic and country-flavored songs recorded several years earlier, and their at times politically right-leaning sentiments alienated some of his audience. He followed with an abrupt about-face in 1981, releasing the hard-edged Re-ac-tor, before mixing it up even more with Trans, incorporating synthesizers and vocoders into his songs and further confusing fans and critics and underwhelming his new label, Geffen. The year 1983 was a tough one for Young, whose poorly received rockabilly offering Everybody’s Rockin’ was the last straw for his label, who filed a $3 million lawsuit against him for producing what they termed “unrepresentative" music. Meanwhile, his ex-girlfriend Carrie Snodgress was also suing him for child support and he was coping with the disabilities of his and Pegi’s two recently born children, Ben (cerebral palsy) and Amber Jean (epilepsy). Unwilling to sacrifice his independence and artistic integrity to please his label, he eventually reached a deal with them in which he would take a pay cut for his next few albums. This led to the heavily country Old Ways (1985), featuring guest appearances by Willie nelson and Waylon Jennings; the New Wave–tinged Landing on Water (1986); and the 1987 album Life, all of which were only mildly successful but fulfilled his final obligations to Geffen. In 1986, Young’s experience with his children's cerebral palsy and epilepsy led him and Pegi to help found the Bridge School in Hillsborough, California, whose mission is to provide education for children with severe disabilities. The school has since been supported in part by annual benefit concerts that attract hundreds of thousands of music fans and feature a vast array of major artists, including Bruce Springsteen Beck, Pearl Jam, No Doubt, Paul McCartney and countless others. The shows are organized by Pegi and Neil Young, who typically headlines as a solo act or with Crazy Horse and CSN&Y. No stranger to benefit shows, Young participated in the 1985 Live Aid concert and has worked with Willie Nelson and John Mellencamp to organize the Farm Aid concerts since 1986. Making his return to Reprise Records in 1988 with blues/R&B-focused This Note’s for You, the album featured a title track of the same name that took aim at commercialism in music. Though initially MTV refused to play the accompanying video in response to Young’s apparent slight, it eventually won Video of the Year at its annual awards. That same year, Young reunited with Crosby, Stills, and Nash for American Dream, which, although it charted at No. 16, was panned by critics. As the premier elder statesman in this new era, Young continued to record and explore, reuniting once more with Crazy Horse to record Ragged Glory (1990) and releasing the noise-laden live album Weld (1991). The following year, he returned to his folk roots with Harvest Moon. Featuring songs such as “War of Man,” “Unknown Legend” and “Harvest Moon,” it was one of Young’s more accessible albums and was a critical and popular success, reaching No. 16 on the charts and eventually going double platinum. Rounding out this happy decade for Young, Crazy Horse backed him up for the 1996 album Broken Arrow and he supplied the sparse, moody soundtrack to Jim Jamusch’s western, Dead Man, which starred Johnny Depp. Jarmusch in turn made Young the focus of a 1997 documentary Year of the Horse. Entering the next decade, Young released his 24th studio album, Silver & Gold. In the wake of the September 11 terrorist attacks, he recorded the patriotic “Let’s Roll” and then followed with the albums Are You Passionate? and Greendale, a concept project with an accompanying film about a fictional town in California that allowed Young to explore the environmental themes about which he has remained passionate throughout his life. However, Young’s steady output was briefly interrupted in 2005 when he suffered a near-fatal aneurysm that required brain surgery. While recovering, he finished work on the reflective, acoustic-based Prairie Wind. A quiet work that addresses issues of mortality in the wake of his illness and the passing of his father, it hearkened back to some of his most popular recordings and reached No. 3 on the charts. But far from mellowing out, in 2006 Young released the angry protest album Living With War, which was inspired by the war in Iraq and featured such tracks as “Let’s Impeach the President” and “Shock and Awe.” After a series of retrospective live albums in the second half of the 2000s, Young released the first installment of a much-anticipated collection of his work—The Archives Vol. 1 1963-1972—a nine-disc box set that covers the first decade of his lengthy career. So far, the 2010s have been much like any other period along Young’s path, filled with reflections on the past, an eye toward the future and a focus on the issues about which he is most passionate. His more recent musical projects include 2010’s Le Noise, the folk standards and patriotic album Americana, the 2012 double LP Psychedelic Pill, the environmentally themed Storytone and 2015’s The Monsanto Years, his 35th album and counting. During this period, Young also published his frank autobiography, Waging Heavy Peace, and despite stating in the intro that he needed to take a break from touring, the longtime musician had already returned to the stage by the time of the book’s release. He and continues to perform on a regular basis. Though Young and his wife Pegi divorced in 2014, they continue their work to support the Bridge School, and Young remains heavily involved with Farm Aid, the Global Poverty Project and MusiCares, as well as championing various political and environmental causes. In August 2018, it was reported that the veteran rocker had secretly married actress Daryl Hannah.